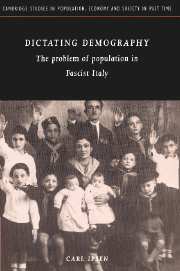 This book is a detailed examination of the demographic policy of Mussolini's Fascist regime. Based on archival research, it examines both the Italian statistics, and the demographic theory of the time. The author shows how the Fascists used statistics to mold public opinion through propaganda, as well as to form policy. He describes their program to increase the population in Italy, and reveals what the policy behind this program tells us about the contradictory nature of Fascism itself--it was at the same time modern and antimodern, revolutionary and reactionary. Introduction; 1. The background: fascism, European population policy, European demography, and the problem of population in liberal Italy; 2. The organization of totalitarian demography; 3. The realization of totalitarian demography I: spatial population movement; 4. The realization of totalitarian demography II: quantitative and qualitative population management; 5. The measurement of totalitarian demography; Conclusion.